We have moved in since July last year and have enjoyed every minute of living in this house we built with OBN. 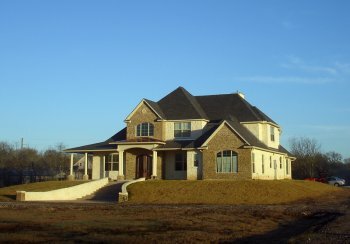 I had never doubted that we could build our dream home with Owner Builder Network, but now when I look around our home, I still have a sense of amazement that we actually changed the landscape of this swamp-like waste land and put a house on it! I think what got us to have faith in OBN is that we have friends that had built with OBN and they all had great experience. Looking back I know we couldn't have done it without OBN. You have the best system and to have you right there ready to assist us whenever we had questions or issues, it made a world of difference. Partnered with OBN saved us a lot of money - we basically built an energy efficient house with minimal cost. I have heard so many stories about people trying to build their home but something went terribly wrong and they either lose money, or go over budget, or didn't even complete the construction. If it were not for your classes, your tips and instructions and manuals, and most importantly your advice, we would have made the same mistakes and be frustrated, and we wouldn't have had the confidence to build in the first place. We cannot thank you and OBN enough. Right now we are concentrating on landscaping and raising some farm birds and animals as well as growing as many trees as we can water. We are enjoying the country life in our home. You, Sheila and the rest of the OBN team have a special place in our hearts as you have helped this happen. Our best regards to you all and have a wonderful summer!